Spasso Milano, a contemporary Italian restaurant currently have 2 branches, notably the latest one being in Pavilion KL. I've been to their previous outlet over at Nihonkan Club in Jalan Ampang (Spasso Milano) before they relocated to Pavilion, and it was a pretty good dining experience. Well, last weekend I was back in Penang and took the chance to dine over at the Spasso Milano in Straits Quay for lunch. 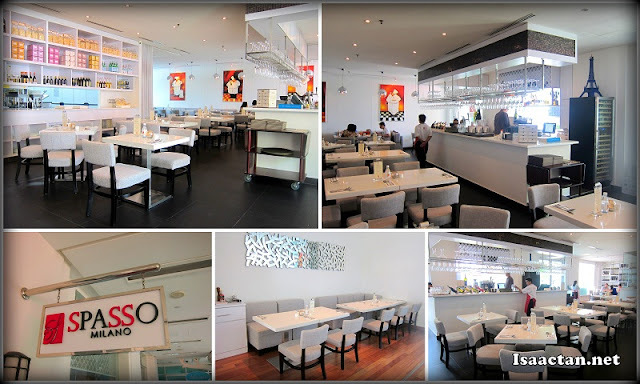 So there I was at Spasso Milano Straits Quay on a fine Saturday afternoon to try out their menu. It was a good day to dine out there, which was just beside the Straits Quay sea line. Even during the day, we already caught some families dining there. The crowd at night was way more as Penang folks love to come over Straits Quay just to enjoy the atmosphere away from the city. We kicked off our lunch with some Calamari Fritti, which were these deep fried extra crispy Squid Rings served with tartar sauce. I always love this appetizer especially when dipped inside my favourite tartar sauce. A nice starter to our heavy meal ahead. Instead of the usual mushroom soup, we went ahead to try out Spasso Milano's asparagus soup which was a really healthy way to go. Served with a loaf of toasted garlic bread, the soup when taken warm had a nice flavour to it. Personally I would still go for some mushroom soup though. Next up was a sharing platter of Smoked Duck Breast. Sliced home smoked duck breast and marinated beetroot, drizzled with Hazelnut oil, this dish was a unique delicacy. The texture of the duck was really soft, and sort of melts in your mouth. I liked the taste, even though it was a bit too salty for my liking, but I was told this dish had to be served this way to retain its flavour. Another unique Italian dish was Spasso Milano's Spinach and Ricotta Ravioli. I did not really get a chance to taste it though as the dish was ordered by a friend. What I do know was that it does look delicious, with the homemade ravioli served in sage butter. Janice, being a seafood lover ordered their Garoupa Orange which came with this rather huge slab of pan seared garoupa fish served with pasta. The sauce was of a citrus orange flavour, and helped a lot in bringing out the taste of the whole dish. I tried a few bites and it's safe to say the fish was really fresh, hence no fishiness taste in it. Janice did mention she really liked the dish though. Have I told you before the first time I actually tried out wagyu beef was at Spasso Milano in Jalan Ampang last year, and ever since then I was hooked to this piece of great meat. The Wagyu Rib Eye served here at Spasso Milano Straits Quay came in a really generous portion, 250 grams of mouthwatering goodness. Wagyu beef, done medium rare, just the way I like it. Done medium rare, the meat was really soft and tender, and it made me real happy that afternoon to have one whole piece to myself. I had mine with a side dish of Pasta Aglio Olio, with the accompanying mushroom sauce. Our dessert for that wonderful Saturday lunch was Spasso Milano's Chocolate Lava Cake. We never fail to order this dessert should we see it on the menu, and when it was served, we were really hoping to see a stream of chocolate lava streaming out from the hot cake. We were not disappointed, as the freshly baked war chocolate cake oozes liquid lava when cut open. Served with a serving of vanilla ice cream, it was a perfect end to a nice meal out at Spasso Milano. Do check out this spot should you happen to be in Penang Straits Quay, while looking out for some nice Italian fare. Smoked duck breast over RM20!!!! And the one I had here with mango, over RM10...and I thought that was expensive. Gee!!! No, thank you...I'll pass - can't afford. Wah! All the foods made me drool.... but the price also give me shout!!! I would love the chocolate lava cake!